With the name of ALLAH the most beneficent and merciful, I would like to thank ALLAH ALLMIGHTY WHO gave me enough courage and strength to complete my thesis on time. On completion of this thesis, there are many people I would like to acknowledge for their Support and assistance in regards to my project. First of all, I would like to thank my respected teacher Professor for his motivation. Secondly I would acknowledge my supervisor. There are no words to express how much your support, guidance, and understanding have meant to me. Thank you so much for all the effort you put in to my research. Without your help I can’t make it possible to complete my thesis. I would also like to thank to the Ministry of Planning, Development & Reforms, China authorities and the local community who helped me to complete the survey for this thesis. Last but not the least; I would like to thank a lot to my parents who supported me in throughout my life. Mutual projects and agreements between two countries always bring many positive changes and major reforms in the benefit of both countries. China Pakistan economic project is one of those projects which will bring closes these two countries and benefits them a lot. As China has become a very developed country. China is economically a very strong and technically skilled country which is interested in starting many mega projects in and with Pakistan. China is a friend country of Pakistan and in the past it has already been completed many successful mega projects in Pakistan. And hopefully these projects would be greater than all previous one. China Pakistan economic project (CPEC) will influence many areas of Pakistan. If we talk about the northern areas of Pakistan, then those areas would be in great influence of CPEC projects. 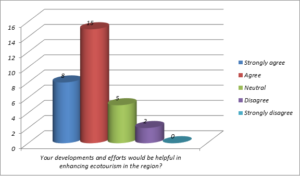 Especially the ecotourism of these areas will be highly affected. The purpose of this thesis is to help to promote the inbound ecotourism in northern areas of Pakistan and to spread awareness about it. This thesis includes topics about impacts of China Pakistan Economic Corridor on ecotourism in northern areas of Pakistan. China Pakistan economic corridor is a series of many mega and small projects with the collaboration of china and Pakistan governments. CPEC has great impacts on the economy of both countries as well as other industries. As far as the tourism industry is concerned CPEC would also impact greatly on that industry. There are some hidden remote worth watching areas which would be accessible after the completion on these projects. However, there are some landscapes which are going to demolish in the result of these developments. It would also have some socio cultural, economic, infrastructural and other impacts in northern areas of Pakistan. The research results show that CPEC projects do have some positives and negatives impacts of ecotourism of northern areas of Pakistan. 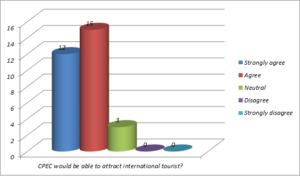 However overall it would be very beneficial for the inbound tourism of these areas. In this research, we describe how china Pakistan economic corridor is impacting the ecotourism of northern areas of Pakistan, its pros and corns. Apart from that we would describe how it is going to change the whole story. In the end we would know how to make to the northern areas of Pakistan an ecotourism hub for the local and international tourists. The CPEC is an ongoing development mega project which aims to connect Gwadar Port of Pakistan to China’s northwestern region of Xinjiang, via a network of highways, railways and pipelines. The economic corridor is considered central to China–Pakistan relations and will run about 2700 km from Gwadar to Kashghar. China-Pakistan Economic Corridor and its connectivity with Central Asia, Middle East and Africa will help to shape entire region. Overall construction costs are estimated around $46 billion, with the entire project expected to be completed in several years. The Corridor is an extension of China’s proposed 21st century Silk Road initiative. This is the biggest overseas investment by China announced so far and the corridor is expected to be operational within three years. The corridor will be a strategic game changer in the region and would go a long way in making Pakistan a richer and stronger entity. The investment on the corridor will transform Pakistan into a regional economic hub. The corridor will be a confidence booster for investors and attract investment not only from China but other parts of the world as well. Other than transportation infrastructure, the economic corridor will provide Pakistan with telecommunications and energy infrastructure. Plans for a corridor stretching from the Chinese border to Pakistan’s deep water ports on the Arabian Sea date back to the 1950s, and motivated construction of the Karakoram Highway beginning in 1959.Chinese interest in Pakistan’s deep-water harbor at Gwadar had been rekindled by 2000, and in 2002 China began construction at Gwadar port which was completed in 2006. Expansion of Gwadar Port then ceased thereafter owing to political instability in Pakistan following the fall of General Pervez Musharraf and subsequent conflict between the Pakistani state and Islamist militants. The current form of the project was first proposed by Chinese Premier Li Keying and Nawaz Sharif on 22 May 2013 in Islamabad, resulting in the establishment of the Pak-China Economic Corridor Secretariat on 27 August 2013. In February 2014, Pakistani President MammonHusain visited China to discuss the plans for an economic corridor in Pakistan. Two months later, Pakistan Prime Minister Nawaz Sharif met with Premier Li Kequiang in China to discuss further plans, resulting in the full scope of the project to be devised under Sharif’s tenure. In November 2014, Chinese government announced its intention to finance Chinese companies as part of its $45.6 billion energy and infrastructure projects in Pakistan as part of CPEC. During the state visit of Xi Jinping to Pakistan in April 2015, he wrote in an open editorial stating: “This will be my first trip to Pakistan, but I feel as if I am going to visit the home of my own brother.” On 20 April 2015, Pakistan and China signed an agreement to commence work on the $46 billion agreement, which is roughly 20% of Pakistan’s annual GDP, with approximately $28 billion worth of fast-tracked “Early Harvest” projects to be developed by the end of 2018. As a gesture of friendship, the Pakistani capital at that time was dotted with slogans and signboards such as “Pakistan-China friendship is higher than the mountains, deeper than the oceans, sweeter than honey, and stronger than steel” – an oft repeated phrase coined by the Chinese to describe their deep ties to Pakistan. On August 12, 2015 in the city of Karamay, China and Pakistan signed 20 more agreements worth $1.6 billion to further augment the scale and scope of CPEC. Details of the plan are opaque, but are said to mainly focus on increasing energy generation capacity. as part of the agreement, Pakistan and China have agreed to cooperate in the field of space research. 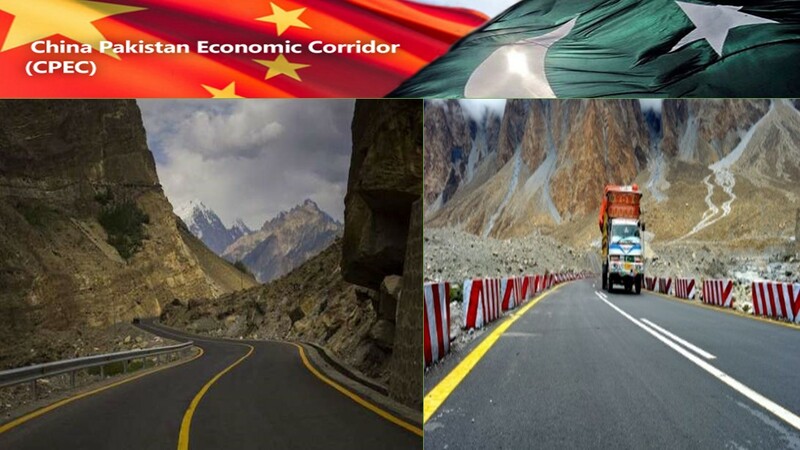 In September and October 2015, the government of the United Kingdom announced two separate grants to the Government of Pakistan for construction of roadways that are complementary to CPEC. In November 2015, China included the CPEC into its 13th five-year development plan, while in December 2015, China and Pakistan agreed on a further $1.5 billion investment to set up an information and technology park as part of the CPEC project. Ecotourism is a form of tourism involving visiting fragile, pristine, and relatively undisturbed natural areas, intended as a low-impact and often small scale alternative to standard commercial (mass) tourism. 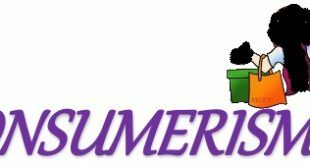 Its purpose may be to educate the traveler, to provide funds for ecological conservation, to directly benefit the economic development and political empowerment of local communities, or to foster respect for different cultures and for human rights. Since the 1980s ecotourism has been considered a critical endeavor by environmentalists, so that future generations may experience destinations relatively untouched by human intervention. Several university programs use this description as the working definition of ecotourism. Generally, ecotourism deals with living parts of the natural environments. Ecotourism focuses on socially responsible travel, personal growth, and environmental sustainability. Ecotourism typically involves travel to destinations where flora, fauna, and cultural heritage are the primary attractions. Ecotourism is intended to offer tourists insight into the impact of human beings on the environment, and to foster a greater appreciation of our natural habitats. North Pakistan is the northern part of Pakistan. Commonly the name North Pakistan is used for the northern natural regions of the country which includes Gilgit-Baltistan, Azad Kashmir, northern Khyber Pakhtunkhwa and a part of north-western Punjab. Ecotourism Society Pakistan (ESP) is an organization based in Pakistan which seeks to promote ecotourism in the mountain eco-regions of Pakistan as a way of raising the standard of living in those areas. Pakistan is having a very attractive and non-neglecting share of ecotourism in the national GDP of the state and the revenues which are generated through tourism in Pakistan has a significant share in the total revenues generated by the state. Not only in Pakistan but all over the globe Nature-based tourism (worldwide) is estimated to generate 7% of all international travel expenditure. Moreover, the World Resources Institute estimates that while general tourism is growing by 4% pa, nature-based tourism is increasing at a rate between 10% and 30% pa. Today’s global nature-based travel market is dominated by ecotourism products, which are estimated to have net worth of close to US$15 billion. It makes sense for Pakistan, a country blessed with strong ecotourism potential. There are several issues, Challenges which area being faced in the Northern areas of Pakistan which is affecting the ecotourism very badly. Amongst all the issues which are being faced in such areas the most threatening is the terrorism, which has an adverse impact on the ecotourism and the attraction of tourism in the country. Recently a very unfortunate event further decorated the situation in which several international mountain hikers were being killed in a terrorist activity which took place in Nanga Parbat which is known as one of the most visited resort and venue for ecotourism in Pakistan. The government is also partially responsible for not developing this industry to the extent it should be done as far as the economy of the state and its contribution is being concerned. A further more serious and mature approach is required to develop this industry so that Pakistan can make the most out of this opportunity and can develop ecotourism is such a manner so that it can play vital role in the stability and strengthening of the national economy of the state. China Pakistan Economic Corridor has great impact on tourism industry of Pakistan as it has designed for the sake of mutual interests and to develop business of both countries. Plans for a corridor stretching from the Chinese border to Pakistan’s deep water ports on the Arabian Sea date back to the 1950s, and motivated construction of the Karakoram Highway beginning in 1959. Chinese interest in Pakistan’s deep-water harbor at Gwadar had been rekindled by 2000, and in 2002 China began construction at Gwadar port which was completed in 2006. Expansion of Gwadar Port then ceased thereafter owing to political instability in Pakistan following the fall of General Pervez Musharraf and subsequent conflict between the Pakistani state and Islamist militants. In February 2014, Pakistani President Mammon Husain visited China to discuss the plans for an economic corridor in Pakistan. Two months later, Pakistan Prime Minister Nawaz Sharif met with Premier Li Keqiang in China to discuss further plans, resulting in the full scope of the project to be devised under Sharif’s tenure. In November 2014, Chinese government announced its intention to finance Chinese companies as part of its $45.6 billion energy and infrastructure projects in Pakistan as part of CPEC. After 2008 the security of Pakistan could not be stable especially in Baluchistan and Northern Areas of Pakistan. Now due to CPEC multiple projects are being started and security conditions are getting better day by day due to army involvement. However, there are some stake holders which are criticizing CPEC for the sake of their personal interests. These stake holders are from outside the Pakistan as well as inside. The main issue of CPEC is its map, the government and other authorities should review its map with the coordination of all other stake holders and get a mutual beneficial map which could be prove best for the development of remote and comparatively less secure areas of Pakistan. To determine the impact of CPEC on Infrastructure. To find out the impact of CPEC on Security & Safety. To ascertain perceived impacts on Tourism industry. Having no professional skills can be the hurdle during research. Permission from the Administration of Ministry of Planning, Development & Reforms and other Authorities can be a hurdle. Less communication can also be a hurdle. Timing of site and researcher could be a problem. Measurement procedures could be a hurdle. Eco-tourism is the travel to enjoy the world’s amazing diversity of natural life and human culture without causing damage to either. A vital requirement is that visitors should show respect for both the environment and the people who live in it. Above all, the tourist industry has to remember a central precept (Crispin, 1994). World wide fund for nature Pakistan (WWF-P) is pioneer in introducing sustainable eco-tourism initiatives in the northern areas of Pakistan. WWF-Pakistan in Northern areas aims at making eco-tourism as sustainable, responsible and environment friendly. To this end, WWF-Pakistan is closely working with the communities, private sector and regulatory bodies for the last 13 years. WWF-Pakistan has been involved in organizing the first convention on sustainable Eco-tourism in 1999, formulation of NA’s tourism development board, training of eco-tourists’ guides and porters, development and distribution of eco-tourism broachers and introduction and facilitation of sport hunting in the area. The term eco-tourism has, in recent years, become a popular slogan used by tour operators all over the world. It could be defined as ecologically, environmentally and socially responsible tourism. The main aims of eco-tourism are to protect and preserve nature and to help provide the means to do so (financial and educational) by directly supporting local communities. Other aspects, such as the sustainability of local culture and history also form part of this low-impact approach to tourism. Eco-tourism involves visiting natural areas with the objectives of learning, studying or participating in activities that do not bring negative effects to the environment, whilst protecting and empowering the local community socially and economically (Christina, 1996). The Northern Areas (NA’s) of Pakistan lies at the extreme North of Pakistan, officially named as Federally Administrated Northern Areas (FANA) comprised of six districts named as Gigot, Gazer, Sankuru, Dialer, Glance and Astor. Northern Areas are known as the axis of Asia. Northern Areas are located between 35-37 N and 72-75 E, where it borders Xinjiang province of China. Chitral lays to its west, Kalam, Kohistan and Kaghan valleys to the south; the newly independent Republic of Tajikistan is only a handshake away and to the East lays the occupied territories of Ladakh and Kashmir, the place where the three major parts of Asia i.e. Southern Asia, Central Asia, and South East Asia converge. Therefore, it is also entitled as the roof of the world (NADP, 2003). The Northern Areas spread over 72496 sq. kilometer and populated by about one and half million, indicating population density of 10 persons per sq. kilometer in 831 villages scattered all over the area. The per capita land holding is 0.124 hectares, which is decreasing day by day, with fragmentation in the families and urbanization. Of the total area, only 69,480 hectares (0.96 pc) are under cultivation whereas, about 60,000 hectares of cultivable land lies barren while, rest of the area comprises rangeland, mountains, forests, lakes/rivers etc. (IUCN, 2003). Pakistan remains a land of high adventure and nature. Trekking, mountaineering, white water rafting, wild boar hunting, mountain and desert jeep safaris, camel and yak safaris, trout fishing and bird watching are the few activities, which attract the adventure and nature lovers to Pakistan. Pakistan is endowed with a rich and varied flora and fauna. High Himalayas, Karakoram and the Hindukush ranges with their alpine meadows and permanent snow line, coniferous forests down the sub-mountain scrub, the vast Indus plain merging into the great desert, the coast line and wetlands, all offer a remarkably rich variety of vegetation and associated wildlife including avifauna, both endemic and migratory. Ten of 18 mammalian orders are represented in Pakistan with species ranging from the world’s smallest surviving mammals, the Mediterranean pigmy shrew, to the largest mammal ever known the blue whale. China and Pakistan have developed strong bilateral trade and economic ties and cooperation over the years. China has gradually emerged as Pakistan’s major trading partner both in terms of exports and imports. Bilateral trade and commercial links between the two countries were established in January 1963 when both signed the first bilateral long-term trade agreement (Ministry of Finance, 2014:126). Under the Free Trade Agreement (FTA) between the two countries – signed on November 24, 2006 and implemented from July 1, 2007 – Pakistan secured market access for several products of immediate export interest.1 Later, both countries signed the FTA on Trade in Services on February 21, 2009 that became operational from October 10 that year (Ibid). The China-Pakistan Economic Corridor (CPEC) is expected to further strengthen trade and economic cooperation between the two countries. Chinese Premier Li Keying emphasized the construction of the CPEC during his May 2013 visit to Pakistan (Tiezzi, 2014). The incumbent Pakistani government has also shown much enthusiasm for the project since then. The corridor will connect Gwadar Port in Balochistan (Pakistan) to Kashgar in north-western China, which will make Gwadar not only fully operational but also a significant deep sea port in the region. Opened for operations in 2007, the control of Gwadar Port was transferred to China’s state-owned China Overseas Ports Holding in February 2013. Since then, Gwadar is undergoing a major expansion to turn it into a full-fledged, deep-water commercial port (South China Morning Post, 2014). When the corridor is constructed, it will serve as a primary gateway for trade between China and the Middle East and Africa.3 The corridor is expected to cut the 12,000-kilometre route that Middle East oil supplies must now take to reach Chinese ports (Ibid). The people of Gilgit Baltistan are equal stakeholders in the Kashmir-Issue and are as much Kashmiri as the Kashmiris living in other parts of J&K. Unfortunately, for all of their history they have been forgotten, neglected, insulted and exploited. In 1949 the area of Gilgit Baltistan was named ‘The Northern Areas of Pakistan’ and put under the direct control of the Federal Ministry of Kashmir Affairs and Northern Areas Affairs, which de facto is run by Islamabad. Afterwards, it was Zulfiqar Ali Bhutto who abrogated the State Subject rule in this part of J&K. The next Pakistani ruler, Zia-ul-Haq, unleashed anti-Shia forces in the region during his term, which caused extreme socio-political polarization in especially Skardu. After that, ‘Tribal Lashkars’ started the institutionalized abduction of women and massacred thousands of Shias in 1988. Pakistan’s stance on Gilgit Baltistan in particular and on Jammu & Kashmir in general has been full of paradoxical ties. In 2009, the Pakistani government passed the Gilgit Baltistan Empowerment and Self-Governance order. The order turned Gilgit Baltistan into a province while Gilgit Baltistan has never been constitutionally a part of Pakistan. It has even no mention in the Constitution of Pakistan. To make matters more complicated and perhaps even incomprehensible, the Pakistani Supreme Court in1994 observed that these areas ‘are part of Jammu & Kashmir State, but are not part of Azad Kashmir’. Utterly contradictory to its actions, Pakistan has officially been rejecting the full integration of Gilgit Baltistan by propagating that such an action would be unjust considering its international obligations with respect to the Kashmir-Issue. Pakistan wrote to propose a change to this clause. It requested to substitute the words “the future status of State of Jammu and Kashmir” by the following: “The question of the accession of the state of Jammu and Kashmir to India and Pakistan”. India did not object to this amendment and subsequently, on the initiative of the Pakistani Government, the question of the future of Jammu & Kashmir and its inhabitants was transformed into a territorial dispute between India and Pakistan. As a result, the resolution of 5 January 1949, changed into: ‘The question of the accession of the State of Jammu and Kashmir to India and Pakistan will be decided through the democratic method of a free and impartial plebiscite’. The people of Gilgit Baltistan have no constitutional guarantees of their political liberties. They have no say over their natural resources and minerals. All decision-making powers in relation to forest, power, tourism and minerals are under the direct control of the Gilgit Baltistan Council, which is headed by the Prime Minister of Pakistan. All the mining licenses are also directly issued by Islamabad. The economic potential of Gilgit Baltistan is such, that had the people been masters of their own destiny and not treated as a colony by Pakistan, Gilgit Baltistan could finance the complete construction of the China Pakistan Economic Corridor. There is an abundance of water resources, minerals worth billions of dollars and an ocean of undiscovered tourism potential in this part of Jammu & Kashmir. Army and Navy will be the actual economic and strategic beneficiaries of this corridor. One of the arrangements of this deal is that Pakistan will purchase eight attack submarines and six patrol vessels from China. This arrangement will elevate China as Pakistan’s primal arms provider, a contract to the tune of 5 billion dollars, while it will seriously disturb the equilibrium in the Indian Ocean and thereby threaten the already fragile peace in the region. Any kind of solution to the long standing Kashmir-Issue will only be jeopardized by these kinds of intrusions. China is not investing billions of dollars to simply withdraw if any solution is found to the Kashmir Issue. Its investment guarantees their strategic interests in the region. The people in Gilgit Baltistan are not in need of economic corridors of exploitation. They are longing for basic human rights and their political liberties. Admittedly, we Kashmiris have also been culpable of neglecting Gilgit Baltistan as we were too pre-occupied trying to liberate just one part of Kashmir on the behest of intelligence agencies, working in their national interests, while they used us Kashmiris as cannon fodder. Pakistan Economic corridor as it is an attempt to further destabilize the region in general and the Kashmir-Issue in particular. No country, not even our so-called elder brother and benefactor, has the liberty to impose economic corridors on us by force. 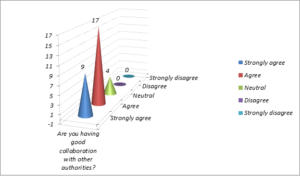 The purpose of this chapter is to explain the research methodology and the specific methods used in this study, the sampling procedures and response rates, the way in which the data was analyzed, and how the limitations and barriers that arose throughout the conduct of the research were overcome. I choose to undertake a survey by using questionnaires, so that quantitative method appeared more appropriate than the qualitative. There are two kinds of research methods, qualitative research and quantitative research, in my thesis I have used one method that is quantitative research. Quantitative research was done by getting filled questionnaires from the authorities as well as the local community. The local community of northern areas and CPEC authorities involved and showed interest. Questionnaires were distributed on individual to the local community and department wise to the CPEC authorities and prior permission was taking before the distribution of the questionnaires. Most of the questionnaires was distributed one by one those who were my acquaintance. The sample was collected from demographic sectors; here are more than 100 volunteers involving. Between all those participants 20 participants were sampled. The aim of this study was to assess impacts of china Pakistan economic corridor on ecotourism industry of northern areas of Pakistan. Two questioners were designed to collect the data. One questionnaire was for the effectors and the second questionnaire was for the affectees. 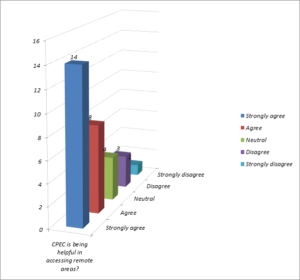 In both questionnaires we raised many questioners which were quite similar and different at the same time to know the opinion from both side i.e. effectors and affectees about different issues. I remain careful in collecting information; maintain information confidential and seeking consent and sensitive information. I tried to avoid inappropriate use of information. Incorrect reporting is also unethical so I tried to avoid this. I focused on the use of appropriate research methodology. 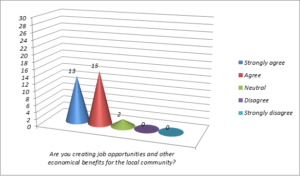 I choose the bar chart view to represent the results of my questions one by one. I choose Gilgit Baltistan, Skardu, Hunza valley, Kashmir, Naran Kaghan for my project calculations. These are the most popular northern areas and ecotourism destinations. 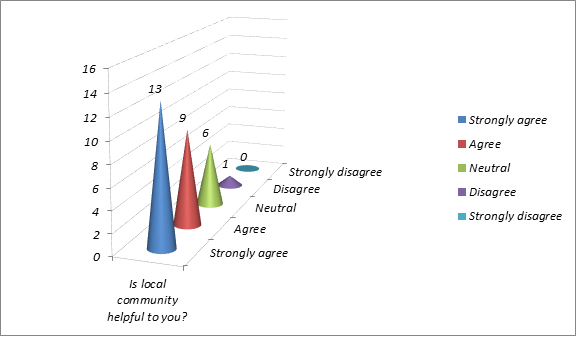 Now below I am giving you a view of the results of the questionnaire I got filled from local communities of northern areas of Pakistan. Are you aware of CPEC & Ecotourism? Most of the people were having an idea about the China-Pakistan economic corridor and the ecotourism. Only very few people from far off regions were unaware from these projects but still they were aware of ecotourism business and its activities. Does CPEC would help in developing the infrastructure of northern Pakistan? 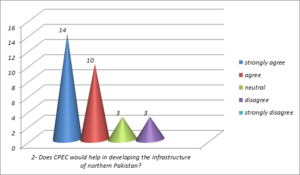 Almost 80% of the people do believe that infrastructural developments would be happen due to China-Pakistan economic corridor projects. This will overall be beneficial for local community and tourists as well. 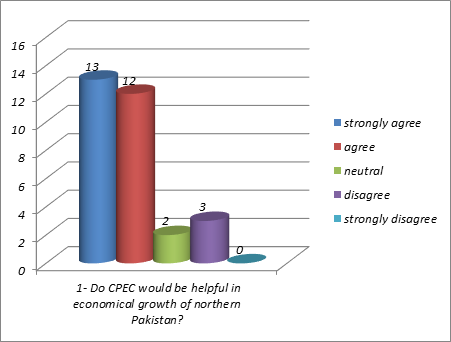 Do CPEC would be helpful in economic growth of northern Pakistan? CPEC projects are going to create a business boom in this region as well as many jobs and ecotourism related business opportunities would be created there. This will be helpful to strengthen the economy of those regions. Due to CPEC the security conditions will improve? Due to serious involvement of Pakistani army the security conditions are very much improved. However, still there are some areas which are not threat free yet. That is why people are afraid to visit those regions till yet. 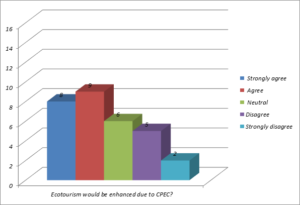 Ecotourism would be enhanced due to CPEC? People have mix opinion about it. Because there are some sights where CPEC projects are not very much influencing. That’s why people believe that it would not make any difference by these projects until unless those sights are not touched. Will you get job opportunities through CPEC projects? People of northern areas are very hopeful to get job opportunities from these projects. Weather they are not very much educated but they have special skills to work in those areas in extreme weather conditions. It is also beneficial for CPEC authorities to get cheap labor from those areas. Is CPEC disturbing any local community? It is the result of well planning and good strategies that the people of northern areas of Pakistan believe that these CPEC projects are not disturbing their communities. However, some orthodox claim that these projects are disturbing them. Is CPEC demolishing any landscape? 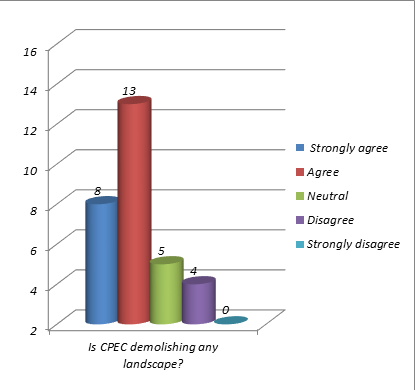 Almost 70% people of northern areas of Pakistan are witness that these CPEC projects are demolishing many landscapes in those regions. Northern areas of Pakistan are full of landscapes and beauty that’s why it is so difficult to complete any mega project like this without compromising on landscapes. CPEC is being helpful in accessing remote areas? Statistical data collection proves that CPEC projects will be helpful in accessing remote areas via their great road networks. Many hidden and inaccessible ecotourism destination would be explored due to these projects. CPEC Projects are disturbing the environment of the area? Almost 77% population of northern areas is witness that these CPEC projects are disturbing the environment of those regions. It is obvious that whenever there would be development there must be some environmental damage which have to be compromised due to targeted developments. CPEC is taking serious steps to protect environment? 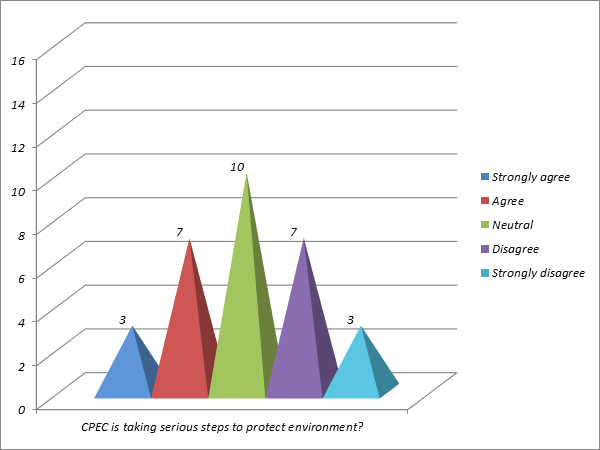 People of the northern areas have mix opinion about it due to unawareness of environmental protection strategies and measurements taken by CPEC authorities. However, still there would be some environmental loses because It is compulsion of any development project. Is there any security threat till yet in your area? Almost 67% people of northern areas still feel themselves unsafe there. Due to CPEC projects Pakistani army have been seriously involved in it but still local community and tourist don’t feel safe to visit those areas. I choose Gilgit Baltistan, Skardu, Hunza valley, Kashmir, Naran Kaghan for my project calculations. These are the most popular northern areas and ecotourism destinations. Now below I am giving you a view of the results of the questionnaire I got filled from CPEC authorities i.e Ministry of planning, development and reforms and others. Are you feeling hurdles in developing CPEC in Northern Pakistan? Analysis: Northern areas of Pakistan have extreme weather and high altitude areas due to which CPEC authorities are feeling hurdles in developing these projects. Apart from extreme weather and area there is international pressure, terrorism threats, political influences and many other reasons due to which they have to face many hurdles. 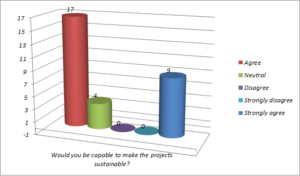 Would you be capable to make the projects sustainable? 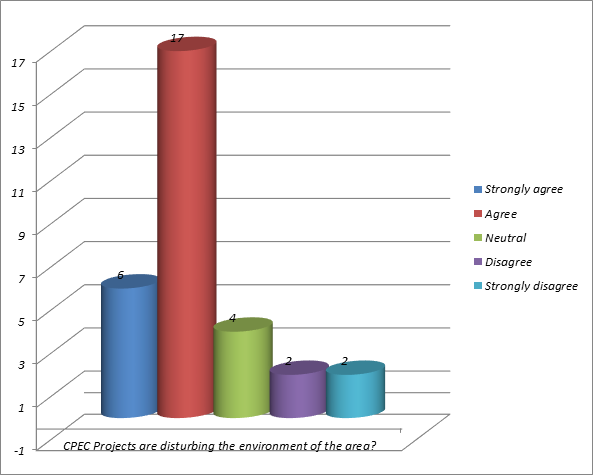 About 87% CPEC projects authorized people firmly believe that they would be capable to sustain these projects. Because these are very mage projects which is happening by the collaboration of giant companies and mutual agreement of two very close countries. 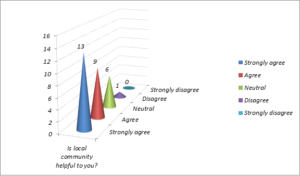 Is local community helpful to you? Northern areas of Pakistan are very under developed and those communities are very welcoming and helpful towards any out-coming activity. CPEC authorities feel very comfortable to work with the local communities of those regions as they are very helpful. Would you be able to fulfill your desire goals? 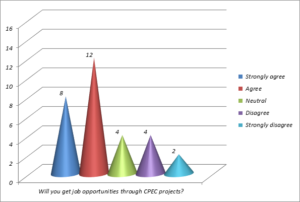 Most of the authorized people of CPEC projects do believe that they would be successful to achieve their desire goals. They are very much confident about their planning and strategies and they firmly believe that they will successfully accomplish this. CPEC would be able to attract international tourist? Due to CPEC projects there would be great infrastructural development due to which tourism from everywhere would be interested to visit those areas. Due to security threats and lack of infrastructure people use to avoid such areas but now due to these projects they are getting attracted towards those areas. Are you having good collaboration with other authorities? CPEC authorities who involve Ministry of Planning development and reforms and other local and Chinese authorities are collaborating with each other to accomplish these goals by making successful these china-Pakistan economic corridor projects. 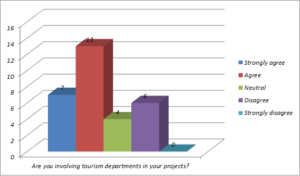 Are you involving tourism departments in your projects? At some areas which CPEC authorities consider ecotourism destination they are involving the tourism department. Pakistan tourism Development Corporation is having collaboration with Ministry of planning, development and reforms regarding CPEC projects. 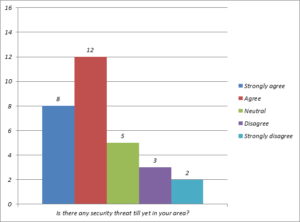 Are you satisfied with the security measures? CPEC authorities are very much satisfied about the security measures. 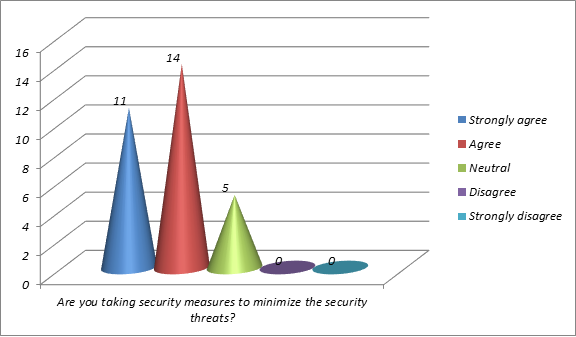 However, still there are some people whole are doubted about the security measure and have questions about it. Due to involvement of Pakistani army the security conditions have been very much improved. Are you taking security measures to minimize the security threats? CPEC authorities are themselves taking security measures to minimize the security threats. However, they are having Full Co-operation from the Pakistani army and government side. But still they are doing some safety precautions for their security. Is government being helpful to provide you safety in your working zone? CPEC authorities are very much satisfied and they believe that Pakistani government is being so helpful to provide the, safety in their work zones. 93% people go with the statement that they are getting full support from the government side. Your developments and efforts would be helpful in enhancing ecotourism in the region? Most of the CPEC authorized people do believe that these mega projects would be helpful in enhancing ecotourism in the northern areas of Pakistan. Because there is no question about the beauty of northern areas but people use to avoid such places due to lack of infrastructure and security threats. After the completion of these projects northern areas will retain their worth and ecotourism will be enhanced. 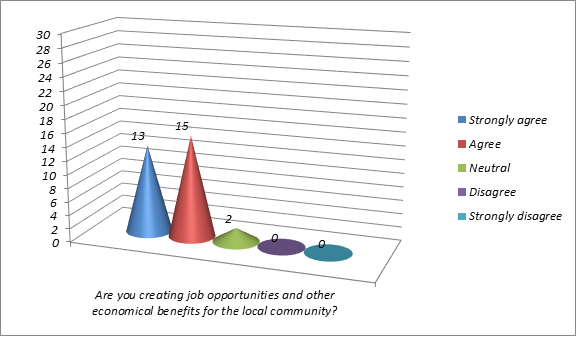 Are you creating job opportunities and other economic benefits for the local community? CPEC is creating great job opportunities for the people of local communities. Because they are getting cheap labors and skilled people who are expert to work in extreme weathers and high altitude areas. Most of the local community of northern areas is dependent on ecotourism. Northern areas have maximum ecotourism potential. Local communities of northern areas have mix opinion about CPEC project weather they would bring change or not. Tourists would be capable to approach the inaccessible of hardly accessible areas easily after completion of these projects. CPEC authorities should create a mutual understanding with the local communities of local areas to enhance the efficiency. There should be promotional campaign to promote tourism in northern areas of Pakistan. There should be happen some mega events to minimize the fear of terrorism in the tourists. 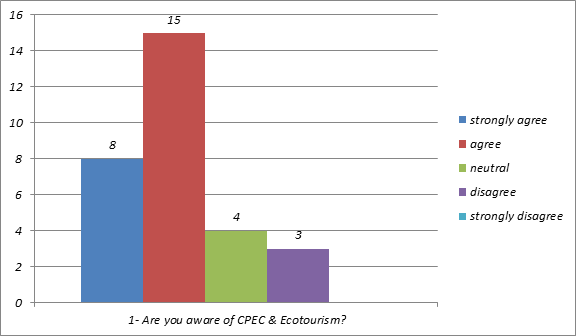 By the data analysis it is concluded that china Pakistan economic corridor is greatly impacting the ecotourism of northern areas. 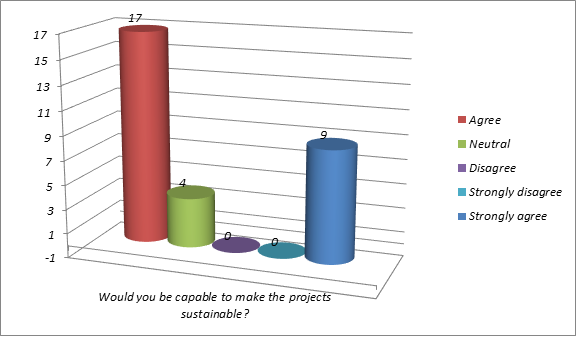 There are some positive as well as negative impacts of these mega projects. Local communities of northern areas have mix opinion about these projects and they have many positive expectations from these projects. However overall these projects would bring a great change in northern areas of Pakistan as in the form of infrastructural development, safety and security, road networks, lodging industry, job opportunities and above all the ecotourism boom in the region. I hope this study of mine have some value in helping the local communities as well as CPEC authorities to understand each other and to give marginal space to each other so that they can participate equally to promote the ecotourism in the northern areas of Pakistan. Andrew, H. 2005. The environmental impacts of tourism in the Annapurna Conservation Area, Nepal. Do the Environmental attitudes and behavior of tourist matter.14(1-2): 34-37. Crispin, T.G.C. and T.F. Lowman. 1994. Defining the eco-tourism. Diversity of Nature’s J.Biblo. 12 (7): 3135. Christina, A. 1996. Parrot conservation and eco-tourism in Wind Ward Island. J. Biogas. 23(3): 5-12. David, A. 2003.Eco-tourism an introduction. Exploring eco-tourism publish in Canada. 1(1): 1-12. Husain, S.A. 2006. The Daily DAWN (20-26 Feb: 2006). A Report: on “Promoting tourism”. 4p. IUCN. 2003. State of environment and development, tourism assets in Northern Areas, Hamdard Press, Karachi. pp.18 128. Pakistan-China Institute. 2014. Islamabad trilateral dialogue: China-Afghanistan-Pakistan October 19th-20th 2014 (pre-conference document). PIPS (Pak Institute for Peace Studies). 2013. Pakistan Security Report 2012. January. I student of M.sc (Tourism and Hospitality Management) is conducting a survey on “Impacts of China Pakistan Economic corridor on Ecotourism of Northern Areas of Pakistan” as per the academic requirement of the university. I request you to fill the questionnaire. I assure you that the information given by you will be kept strictly confidential and used for academic purpose only.